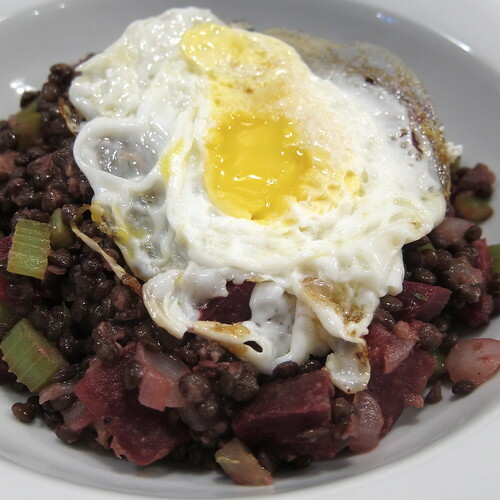 I was planning on making pizza with beets & potatoes on it last night but, in the middle of the day I got a craving for a warm lentil salad with a rich egg yolk running through it. After a brief look through the cupboards I realized I had everything on hand to make one plus I could still use the beets. It also gave me an excuse to use the beluga black lentils I picked up in Seattle. This salad is good without the egg but there is something about the way it tastes with the soft yolk that just sends the flavor to a whole other level. Cook the lentil according to directions until soft. Drain. Meanwhile, clean the beets & boil them until soft, about 20 - 25 minutes. Drain & let cool. Cut into small pieces. (You could also roast the beets if you wish). Put 1 tablespoon of olive oil in a large skillet. Heat over medium-high heat. Add the onion, celery & garlic & sauté until tender. Add the cooked lentils & beets & heat through. Whisk the remaining olive oil, vinegar, mustard & thyme together. Season to taste with salt & pepper. Stir into the warm lentil & vegetable mixture (I'd add a little at a time to make sure not to overdress as everyone likes a different amount of dressing). Keep warm. Poach or soft fry the eggs. Divide the salad between two dishes & top each with an egg. Yu-u-u-u-UM! I'm adding this to the to-do list! I can't wait to make this salad! I really feel there isn't much better than a poached egg nowadays. Having just discovered (un-canned) beets, I can only imagine this is OUT OF THIS WORLD delicious. I just read about beluga lentils yesterday. I haven't tried that variety yet. This recipe looks great! oozy egg automatically bumps up the yum-factor. great dish! An egg over beans is always delicious, comforting- not to mention farily quick (always an added bonus). I just made this recipe and it was fantastic. I have lots of leftovers. I hope they last in the fridge for a day or two. Thanks, Kat!